On May 15, 1999 eleven of the Club members traveled up to Kelsey Bass Ranch. You are probably asking yourself where is Kelsey Bass Ranch. To answer the question, it is north of Turlock near the town of Snelling. 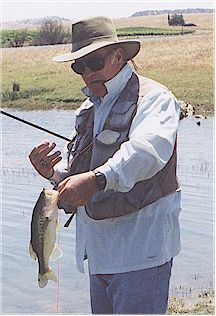 The ranch is an active cattle ranch that has a pretty good size lake on it which can be fished for a price. The Club got a real good deal, and it was well worth the price. 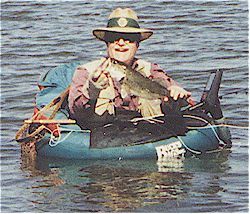 When most of us arrived, it was a bit windy but the lake was very fishable, either from the shore or in a float tube. Those who used boats had a bit of a problem holding the boat in place and fishing because of the wind. Most people caught fish. There were 21 inch bass caught, and Wayne Taylor Jr. hooked a bass that he couldn't hold up with an eight weight rod. The fish eventually broke off. Joe Misfud for being the first to arrive. Wayne Taylor Jr. for hooking the biggest fish. Alan Fisher for having tied the best looking Dahlberg divers. Joe Piazza for having the biggest boat. Tomb Lamb for having the newest boat. Dave Kruss for making the quickest trip across the lake for lunch. Tom Kilfoil for catching the biggest fish (21 inches). He may share this award with David Harris. Dave Harris for catching the most fish - over 90. Phil Drees for having to travel with Wayne Taylor. Wayne Taylor and Rich Catanzaro for being great fishmasters. We all shared in a great lunch of hot dogs and beans prepared by the fishmasters. A good time was shared by all and you'll probably see Kelsey Ranch on the list of fishouts for next year.